On January 2, 2017, Blackboard Learn will have a new look and feel. Although the new “theme” is fairly subtle, it will enable a much more responsive design for students accessing their courses through their mobile devices. The course menu is now white, with limited ability to customize (see Figure 2 below). Can I customize my course menu at all? No. The new theme will override any customization to your course menu, including background colors and buttons. You can however, change the title colors for names of folders, files and items in the main content area. If you have questions about how the new look and feel impacts your course, contact the Technology and Learning Program at 898-6167 or send an email to tlp@csuchico.edu. Figure 1: Blackboard Learn Home page with new Organizations tab and 2-column layout. Click on the screenshot to zoom in. 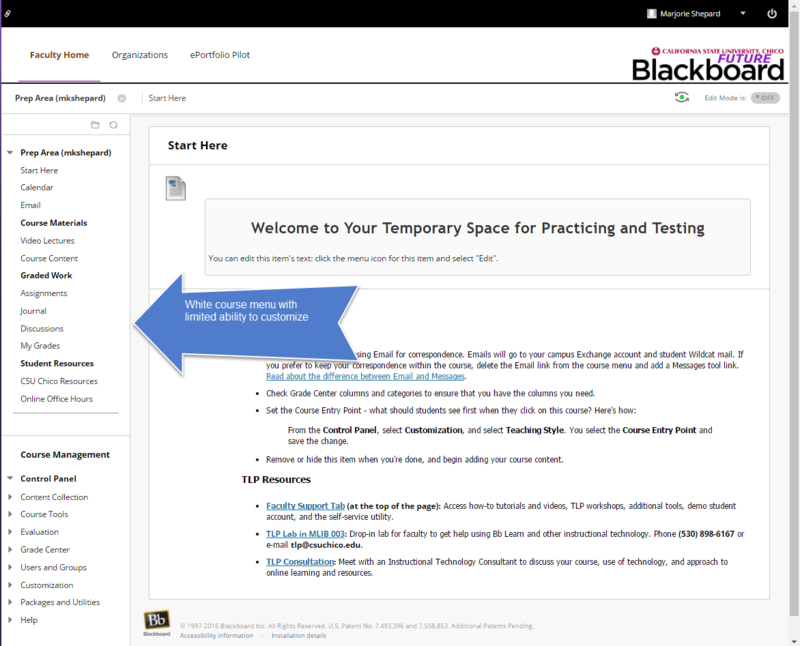 Figure 2: Blackboard Learn Course menu is now white; with no ability to customize color. Click on the screenshot to zoom in. Please note that CSU Chico will turn off access to Turnitin PeerMark on January 5, 2017. Keep in mind, it is only PeerMark that is being turned off; Turnitin Originality Reports and GradeMark are still available. While these may not have the same level of integration with Blackboard Learn, they are worth exploring. Thank you for your understanding and willingness to explore other options. And of course, if you have a favorite tool you want to share with us, we welcome your input. Blackboard has discontinued Collaborate “Classic,” for its more modern interface referred to as Collaborate “Ultra.” This means you will no longer have access to Blackboard Collaborate Classic or Classic recordings as of Spring 2017. If you would like save any of your Bb Collaborate Classic recordings, follow the steps in this tutorial or contact the Technology and Learning Program (TLP) at 898-6167. Please save your recordings prior to February 15, 2017. While Zoom has a reputation of being more robust and easier to use, we are still in the early adoption phase and you should note that the integration with Blackboard Learn is not as deep as Blackboard Collaborate Ultra. We recommend you meet with a consultant from the Technology and Learning program to determine the best option for your needs. How do I try Blackboard Collaborate Ultra? From your course menu, click (+) and add a tool link to Blackboard Collaborate Ultra. Click Join Room to check out Bb Collaborate using your default course room. Refer to Blackboard’s Getting Started resources if you want to quickly learn how to share content, invite guests, record a session, etc. How do I try Zoom? From your web browser, go to http://www.csuchico.edu/zoom. From your Personal Meeting Room, click Start and invite a friend to join you. It’s fun and easy. Refer to the Getting Started with Zoom at Chico State guide for information on changing default settings, enabling breakout rooms, and integrating with Blackboard Learn. The Technology and Learning Program is available to do individualized Blackboard Collaborate Ultra or Zoom training for faculty and support staff. Contact Jim Aird (jaird@csuchico.edu) or Marjorie Shepard (mkshepard@csuchico.edu) to schedule your training for December 2016 or January 2017.